John Patterson Green, b. 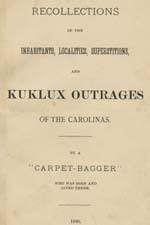 1845 Recollections of the Inhabitants, Localities, Superstitions, and KuKlux Outrages of the Carolinas. By a "Carpet-Bagger" Who Was Born and Lived There. Recollections of the Inhabitants, Localities, Superstitions, and KuKlux Outrages of the Carolinas. By a "Carpet-Bagger" Who Was Born and Lived There. African Americans -- South Carolina -- Social conditions. Ku-Klux Klan (1866-1869) -- South Carolina. South Carolina -- Description and travel. South Carolina -- Social life and customs.